The FH9 is a folding knife which is a tool to be reckoned with as you can obviously expect from Fallkniven. Sheath knives are known to be stronger than folding knives. The folding knife is also far dearer to make since they are made out of parts that move around, and these consume man hours as well as being much more painstaking to perfect. However there are those enthusiasts who will swear by a folding knife instead of a sheath knife not just for aesthetical sake but also due to the handy format and the considerable more discreet qualities which make them especially attractive when operating in an urban environment. The FH9 is in fact a professional folding knife for hunting and although it is rather slim, it belies its appearance by offering natural functions and extreme reliability even when operating in a forest and hunting environment. When examining the blade, one notes that it has a rather distinctive front lock as well as a rigid clip which grips and clasps the knife firmly to its pocket lining. The knife’s dimensions are quite normal for a folding knife. It is 158mm long and has a blade length of 67mm with a thickness of 3mm. It is on the light side although not unduly so at 91 grammes. The steel is the incredibly strong 3G format which has won Fallkniven accolades the world over with a hardness of 62 HRC. 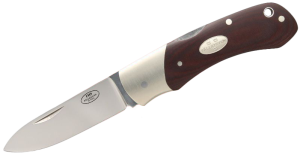 The knife’s handle comes in a very attractive Maroon Micarta and the lockback mechanism is right up there with the very best. The FH9 is a knife which combines flexibility with practicality as well as style for the discerning enthusiast.